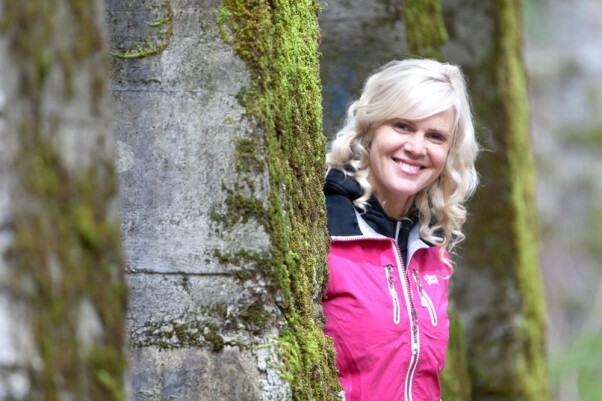 Local woman Josie Boulding’s ‘restless’ adventures are a YouTube and TV sensation. A visit to the Hornby Island radio station takes me to what appears to be a nondescript outbuilding next to Hornby’s Joe King Ballpark. The 500-or-so-square-foot concrete rectangle sits on the edge of the forest, and has no signage or any indication that it is in fact the headquarters of CHFR, Hornby Free Radio, 96.5 FM. Well, I think, this is Hornby Island—laid back. Mellow. Of course, the radio station would reflect this. But I know, because I’ve tuned into CHFR, that it also reflects another side of the Island. This is, after all, a place renowned for being home to a huge amount of artists of all kinds—painters and potters, singers and songwriters, poets and performers. It’s a place where most people define themselves (and set their daily schedules) not so much by their careers but rather by their creative pursuits, their community engagement, and the status of their garden. A place where, astonishingly, a population of a little more than 1,000 can sustain a totally volunteer radio station that offers almost 100 hours a week of programming. From 8:00 am each morning till anytime up to midnight, the airwaves at 96.5 FM are hopping. Almost every musical style has a show—jazz, reggae, classical, blues, Latin, country, biker rock, heavy metal, world, 80s music, African music and more. And there’s a variety of talk radio ranging from radio plays to local issues to American politics to readings of Harry Potter (in a faux-British accent, no less). All of this happens on an annual budget of less than $4,000, and with a minimum of fuss—while meeting the national standards of the CRTC and Industry Canada. I’m at the station to talk to Phil Bailey and Maggie May about how CHFR came to be and how it remains so viable, and about the joys and challenges of setting up and running an independent radio station. We sit in the bigger front room of the station, probably, I’m thinking, the office. The walls are covered with tacked-up notices, to-do lists, newspaper clippings, old album covers, and music posters. The studio is just behind a glass door. A man comes out to talk to May and Bailey about scheduling. They introduce him as Daniel Wiseman, co-host of the Classical Hornby Island Show. “Oh, I hope you have the sound on out here so you can hear the show,” says Wiseman. “I’m going to be playing some great stuff.” Once he is reassured that the show is indeed playing in the office, he goes back to the studio. May and Bailey were both deeply involved in founding the station and currently sit on its seven-person board of directors (as well as, of course, hosting their own weekly shows). May is passionate and leans forward in her chair to emphasize her points; Bailey is low-key and leans back, and the two of them seem to work together seamlessly. 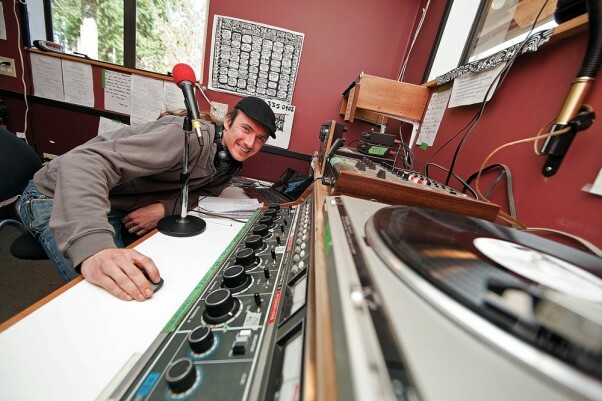 Their involvement in local radio on Hornby goes back some 12 years, to what might be called CHFR’s predecessor—a pirate radio station that operated for about a year, sequestered in the home of a Hornby Island resident. Pirate stations are illegal because they operate without a licence—essentially, squatting the airwaves. However, they often manage to escape detection and keep functioning for some time. The Hornby station was going strong until someone from Industry Canada got a phone call from a member of the public, asking if the station had a licence. As a result, an official was soon knocking at the door of the station’s host, and that was the end of that. But of course it wasn’t. A group of radio enthusiasts, most of them from the original station, reformed and decided to go legal. “This way we would know we’re secure,” says Bailey. “And it allowed us to bring it forward more in the community. We’re run by a board and have a mandate to serve the community,” adds May. The pirate station closed in 2001, and it took almost 10 years to get CHFR launched. Setting up and managing a non-profit society tends to be a slow business anyway, but the group had the added challenge of getting the radio infrastructure in place. “All the shows in their own way reflect the community in some way,” says Maggie May, outside the radio station building. “The transmitter was really expensive, and we needed to build the station,” Bailey explains. That meant raising funds, agreeing on a design, dealing with Islands Trust bylaws, and all the challenges of construction—as well as the sometimes challenging work of getting a group of passionate people to agree on both big and little decisions. “There were clashes at times,” says Bailey with a smile. “I was against building anything. I wanted to be in a trailer.” Clearly he, like the others, was able to accept compromise gracefully and keep moving. There was, after all, plenty to move through. Momentum waxed and waned for several years, but eventually everything was ready to go. “A guy from Industry Canada came to check it out, and everything was good. On Monday, December 6, 2010, we went live,” Bailey says. CHFR has a five-year “developmental licence”—kind of like a “learner’s” or “novice” vehicle licence. If, after the five-year period, everything has been going well, it will “graduate” to a more permanent licence, which will allow it to have a higher wattage. Radio in Canada has to fulfill the requirement of two different bodies. Industry Canada governs technical issues like the building, the wattage and the frequency. The CRTC has rules about content. For instance, 30 per cent should be Canadian and 25 per cent should be spoken. This is not a big challenge on Hornby, where many of the show hosts like to play local musicians and talk about local and global issues. Responsibility for making sure the station meets these requirements rests with the seven-member board, with the cooperation of approximately 45 volunteer radio hosts. Each board member takes one day a week to be station manager, training new show hosts, trouble-shooting technical glitches, and filling in if someone can’t do their show. And they too clean up the coffee cups. It’s a big commitment. Clearly, these people believe in community radio. I ask May and Bailey what need the radio fulfills. Apparently, it’s the wrong question. As if on cue, Wiseman pops out of the studio again. “Sorry to disturb you. I just want to encourage you to listen to this next piece. It’s an amazing collaboration—a jazz saxophonist from Norway teaming up with the early music quintet, The Hilliard Ensemble. They got together in a monastery and recorded these devotional chants. It’s just wonderful. I think you’ll like it.” And he heads back into the studio. Clearly, playing tunes is one of the main raisons d’être of the station. But there is more to it than that. A small independent radio station on a remote island plays an important social and political role in the community. May agrees. “All the shows in their own way reflect the community in some way. If there is something heavy going down, it shows up,” she says. Both May and Bailey are resistant to suggestions that they put CHFR out on the internet. Also, he points out, with internet radio, because there is so much choice, people browse around and listen only to what they already know they like. With a local FM station, listeners tend to stay tuned in and hear music and talk radio that might bring them something new or unexpected. The internet is above all a global medium, where “the local” has little value, if it can even be said to exist at all. To May and Bailey, that makes it an inappropriate medium for their project. “We all came to Hornby to get away from the rest of the world. We want things to be different,” Bailey says. The two friends acknowledge that other board members have differing opinions. The internet question, they say, is one of a handful of contentious issues that spark lively discussions among board members. Other hot topics are the pros and cons of having paid advertising and sponsorships, and whether or not to have a paid staff person. These are the issues that any non-commercial radio would face, and May and Bailey know that these discussions are an essential part of the project. In the meantime, they know that much of Hornby Island is tuning into CHFR. As we finish our interview, Daniel Wiseman slides open the studio door again. “Wait for this next song. Please. It’s coming on in a minute. It’s a guy named Djivan Gasparyan and he’s playing a traditional Armenian woodwind instrument, the Duduk, and it’s exquisite,” he says. Unable to resist such heartfelt enthusiasm, I sit back and listen. The Duduk is moody, mournful, and emotional. The song speaks to me of ancient times and far-away places, and it moves me into a completely new mood—inward, contemplative, timeless. Wiseman sticks his head out. “Do you like it?” he asks eagerly. Oh yes, yes, I say, pulling myself reluctantly back to the here and now. Wiseman beams. At that moment, CHFR is very clearly fulfilling its mission. The Josie Boulding I meet one sunny day in early March does not appear to be the same woman that I had Googled and watched on YouTube earlier that day. She is seated comfortably on her living room sofa, long legs tucked beneath her, and she appears laid-back and relaxed. It was hard for me to imagine her wearing hiking boots and khaki shorts, perched on a mountaintop. Or see her wearing a wetsuit and surfing in Tofino. But, when she begins to talk about her latest adventures, her eyes light up with enthusiasm and the fun-loving spirit of the Restless Josie that I observed in the videos joins the conversation. Boulding, who is a Vancouver Islander by birth and Comox Valley resident since 2001, has become a YouTube sensation since her Restless Josie adventures first started appearing on the internet about three years ago. Like most overnight sensations, travelling the road to recognition took a long time. This outdoor loving attitude is not surprising, considering where she grew up. Her parents, Myra and Jim Boulding, founded Strathcona Park Lodge and Outdoor Education Centre, near Campbell River, in 1959. While most kids have memories of going to summer or winter camp, Boulding, along with her two brothers and two sisters, had the privilege of growing up there. Today, Boulding’s daughter and several nieces and nephews are making similar memories. The award-winning outdoor education centre remains under family stewardship and is managed by her brother, Jamie. 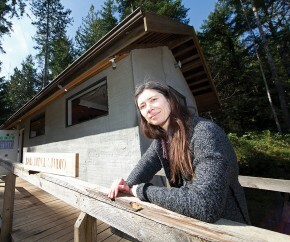 In addition to the extensive outdoors education she received at Strathcona Park Lodge, Boulding attended French immersion school in Campbell River. She spent a year in France after graduating from high school—“searching to discover what she wanted to do in life”—and then she returned to Canada to earn a photography diploma from the Western Academy of Photography in Vancouver. Boulding worked as a photographer in Vancouver for about 10 years and then moved to the Comox Valley. She continued to work as a photographer and taught in the photography program at North Island College. Life was good for Boulding—she was happily married and had a beautiful daughter— but she was still a little restless. One day, one of her sports-loving friends, who was all too familiar with her restless and fun-loving nature, heard what she was up to. They jokingly called her ‘Restless Josie’ and the name stuck. With YouTube and social media, Boulding was quickly able to build a fan base of more than 20,000 people who were captivated by her outgoing nature and sense of fun. The first 10 Webisodes saw her globe trotting in a “search to rediscover her restless spirit.” She went to Brazil and filmed an episode on what makes Brazilian women so confident. She went down under to cover the World Junior Surfing Championships in Australia. She skied and snowboarded in the Rocky Mountains. And she went rappelling through the treetops at, where else but the beautiful Strathcona Park Lodge on Vancouver Island. Fortunately, Boulding was able to secure some sponsorship support in the form of free clothing and equipment. Eventually, she would be offered free trips and hotel stays, which enabled her to continue to broaden the scope of her adventures. As Restless Josie’s YouTube fan base grew, Boulding decided to go out on a limb and pitched the idea for a television series to CHEK TV. Producers loved her proposal and contracted her to produce a series of seven 30-minute TV episodes. Filming for the Restless Josie TV series began in May, 2011. She started filming her second season in March 2012. Producers described the series as: “The first adventure sports-fueled travel show in Canada that also explores a sense of empowerment, happiness and freedom—inspiring people to find that for themselves. With the backdrop of beautifully photographed landscapes and utilizing energetic, independent Canadian musicians as its soundtrack, Restless Josie creates a unique perspective and experience in travel. For the fall 2011 series, Restless Josie went surfing in Tofino, got a backstage look at the Calgary Stampede, covered a mountain biking event at Whistler and then did some extreme mountain biking in the Comox Valley. She went rock climbing in Squamish and attended Canada’s Hottest Beach Festival—the Centre of Gravity in Kelowna—and then covered the Quick Silver Pro Surf competition in Long Beach, New York. The series aired on CHEK on Thursday nights at 7:30, starting in late September, 2011. The show has since been picked up by another television network, TUFF TV, in the USA. With an audience of 45 million viewers, this can be considered a major achievement for anyone, let alone a Comox Valley girl! Planning for the 2012 Restless Josie TV series is well underway and Boulding is looking forward to more great adventures. Her first trip was in March and took her to Quebec to report on the Red Bull World Champion Crashed Ice Competition. This crazy sport has male and female athletes wearing full hockey gear and ice skates ‘downhill skating’ at break-neck speed down a dare devil course. This year’s course was constructed through the hill streets of Quebec City. Ironically, Restless Josie was there in person to witness Kyle Croxall, a Canadian Forces Base firefighter from our very own 19 Wing Comox, win the World Championship! While she is thrilled with the success of her program, and her role as executive producer of the show, Restless Josie never stops dreaming. She has her sights set on even larger projects. If you think it sounds like Boulding’s life is all play and no work, think again. “Having a TV show is no different than starting a small business,” she explains. “I spend a lot of time sitting at my computer. I have spent many years working long, hard hours at my desk and doing many different jobs—from marketing to fund raising—in order to get where I am today. There were times when I just wanted to quit, to pack it all in and give up, but my family, especially my mother, encouraged me to go on. “What I love about my work is that, while I may be away from my family for short periods of time, when I am here I can spend quality time with my daughter,” Boulding says, adding that “at age seven she still thinks I’m a superstar! “This job provides me with flexibility and my husband, who is also self-employed and works from home, shares childcare responsibilities. My family is really important to me. Boulding is quick to admit that she is one lucky gal. But she says that her real goal in this whole Restless Josie endeavor is not to be a famous face on TV but to empower others—especially women—to believe in themselves and have the courage to follow their hearts. Boulding concludes by saying: “My father passed away when I was 12. He left me with a good foundation, but also with a hole in my heart. Recently I have discovered that, as I grow older, my connection with him becomes stronger—maybe because the past becomes more relevant when we’re searching for answers. I’m happy to say I’ve enjoyed all of the excitement, frustration, heartache, jet lag, adrenaline and understanding that Restless Josie has gifted to me. Follow the adventures of Restless Josie at www.restlessjosie.com.